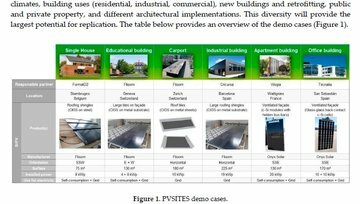 This Open Access paper supported the presentation of the PVSITES project at the Sustainable Places conference (Middlesbrough, UK) in June 2017. 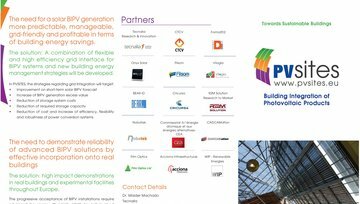 It summarises the project goals and expected impacts. 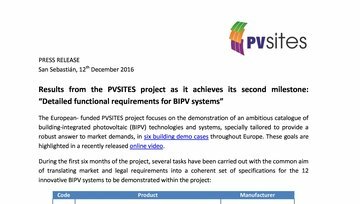 Press release issued in December 2016, after all the technical specifications for the BIPV modules and the energy conversion and management systems under development have been defined. 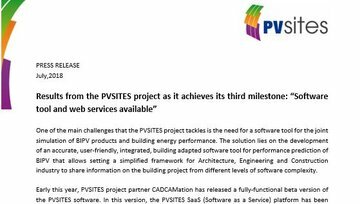 This leaflet summarises essential information about the PVSITES project: its purpose and planned activities, the consortium behind it, as well as contact details for anyone interested to get in touch. Please feel free to download, print and distribute this leaflet in relevant circles. We would love to hear from you to know about it if you choose to do so.